1. Bessie Mary Mansueto was born on December 7, 1915, at Painesville, Lake County, Ohio. Bessie married Salvatore Venditti, son of Luigi Venditti and Filomena Colace, on September 2, 1933, at St. Mary Catholic Church, Painesville, Lake County, Ohio. Bessie died in 1981. Her body was interred at Riverside Cemetery at Painesville, Lake County, Ohio. 2. 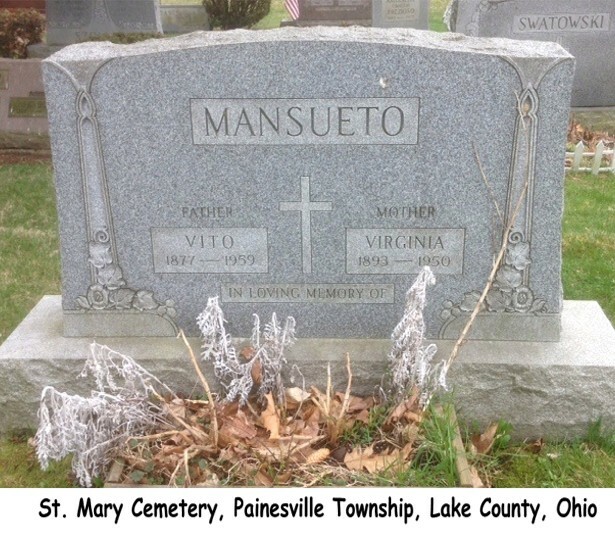 Mary Mansueto was born on March 5, 1919, at Painesville, Lake County, Ohio. Mary married John Sweeney. Mary died on November 9, 1998, at Painesville, Lake County, Ohio, at age 79. Her body was interred at All Souls Cemetery at Chardon, Geauga County, Ohio.